The patient's dental history is a valuable aid to the dentist. It provides communication between the dentist and the patient, and allows the dentist to trace the history of the complaint through symptoms described by the patient. Often, patients reveal valuable information regarding previous injuries to the teeth, even though they may have occurred many years earlier. A clinical examination of the oral cavity allows the dentist to visually inspect the patient's mouth providing clues to the nature of the patient's problems. Such clinical signs as discoloration of the teeth, crown fracture, gross caries, swelling, abnormal soft tissue, and a draining abscess can be identified during a clinical examination. Radiographs of the teeth and bone are one of the most valuable diagnostic tools the dentist has to evaluate structures that cannot be seen by clinical examination, such as the pulp and periapical tissues. The presence of bone loss in the periapical area in response to a necrotic pulp can be detected on a radiograph as a dark area surrounding the apex of the root. The presence of this dark area, or radiolucency, on a dental radiograph is an important feature used to diagnose pulp and periapical disease. Periapical pathology appears as radiolucencies on a radiograph. Radiographs can also reveal possible causes of pulpal injury before bone resorption occurs. Root fractures, deep caries, and previous pulp exposures are some examples of possible causes of pupal injury detected on a radiograph. An accurate radiograph can reveal root length, abnormal root curvature, and abnormal calcification, which is helpful information in determining if the tooth can be treated endodontically. A radiograph, properly exposed and processed, can last indefinitely and provide a permanent record of the condition of the patient and be used for future reference. Comparison of the initial radiographs with postoperative radiographs is a valuable index to determine if the treatment was successful. 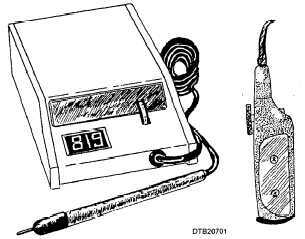 Two of the common pulp testers used primarily to determine whether the pulp is vital or necrotic (nonvital) are shown in figure 7-1. Electric current is used to stimulate nerve fibers in the pulp through the dentin layer. General information about the status of the pulp is obtained by comparing the response of a suspected tooth with that of a normal tooth (control tooth) of the same type on the opposite side of the mouth. The amount of current delivered to a tooth is indicated by a numerical scale. The patient holds the ends of the probe to complete the circuit. Higher numbers on the scale indicate that more current is delivered to the tooth. As the current is increased gradually, the patient is instructed to let go of the probe whenever a sensation is first detected within the tooth. Generally, the sensation is described as a slight tingling or warm feeling. The number at which a response occurs is recorded and compared with the test results of the control tooth. A tooth with a necrotic pulp will not respond to even the most intense electrical stimulation. A dying pulp can produce a variety of responses, depending on the state of the pulp at the time of the test. However, the number readings are relative and cannot be used to diagnose vital pulp. Thermal Sensitivity Test The thermal sensitivity test exposes a tooth to extremes in temperature and provides an accurate method of identifying the problem tooth, as well as determining the status of its pulp. The two most common diagnostic tests are cold and heat. Figure 7-1. - Two common pulp testers.